The EZ2® Rotary Cabinet Add-On Unit from Datum consists of an inner cabinet with 6 shelves per each side that rotates within an outer cabinet. The EZ2® comes with slotted and adjustable shelves and two dividers per shelf opening. The base mechanism permits easy, manual rotation without the use of a pedal. Store everything from end tab folders to hanging files and computer media with a slight change of configuration. Units include 5 adjustable shelves and a fixed bottom shelf per each side. Backstops on all shelves, 2 dividers per shelf opening, levelers and a lock assembly that allows the unit to be locked in the open and closed positions are also provided. 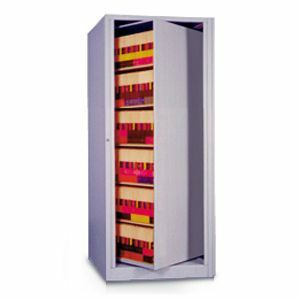 EZ2® rotary cabinets are HIPAA compliant and have a lifetime warranty. •Interchangeable Shelving Components: pass-through shelves and posting shelves. 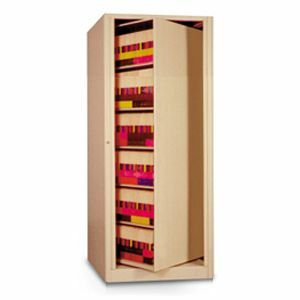 •Various Drawer Options: hanging file drawers, media drawers and pullout drawers. •Available in 17 standard colors. An Ancom represenative can supply you with a color chart. •Cabinets come in starter and add-on units, which are connected for additional stability. •Legal size cabinets are available also. Call for a quote.